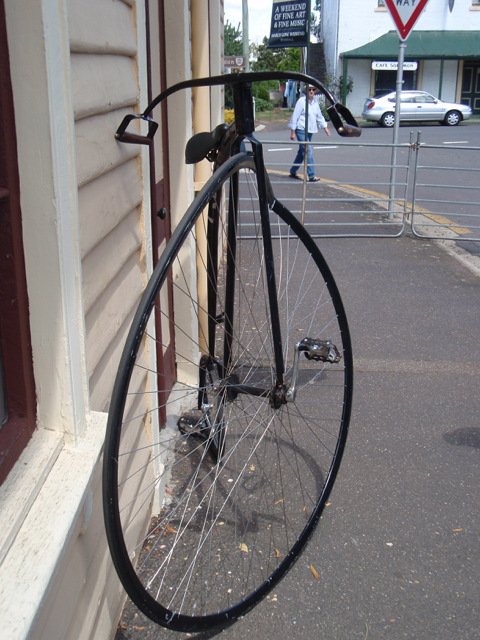 Time for racing a Penny Farthing! We flew in to Launceston late Thursday night. As usual, our bikes didn’t arrive with us (thanks Qantas..). Lucky we have learnt not to rely on them. 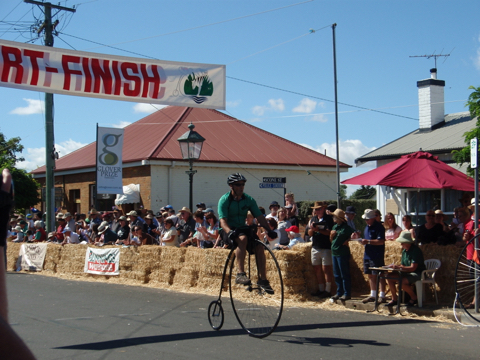 Penny Farthing racing started on Sat morning, so we arrived in Evandale (a small town 10 kms from Launceston, TAS) at about 8am. 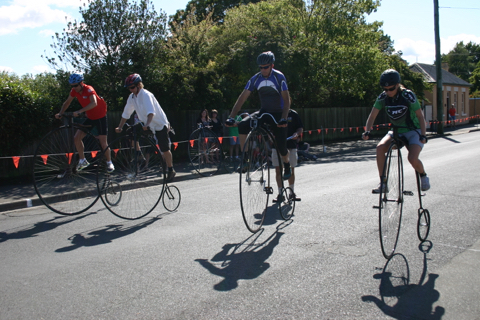 Ian and my Mum had the Penny Farthings ready to race. 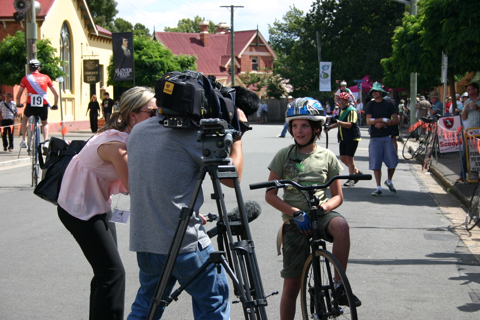 The day consisted of heaps of different races. Check out the website for more information. Tony and I had to ‘mix and match’ races as we only had the one bike between us. I raced in the Slow Race. 25 meters as slow as you can go. I won the first heat, but crumbled under the pressure of my semi final. 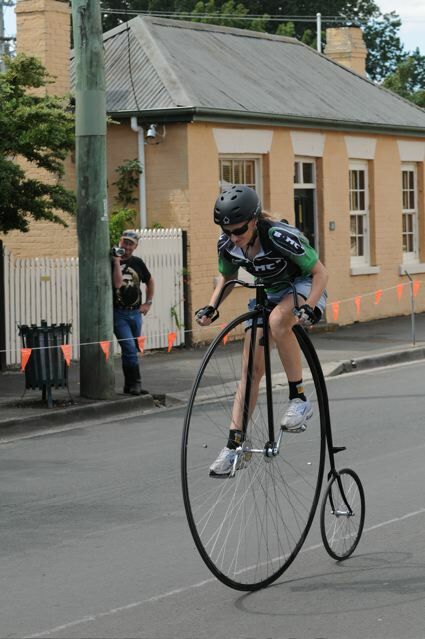 Going slow on a Penny farthing is very hard! Tony then raced in the slalom and then the novice race. He went well in both. 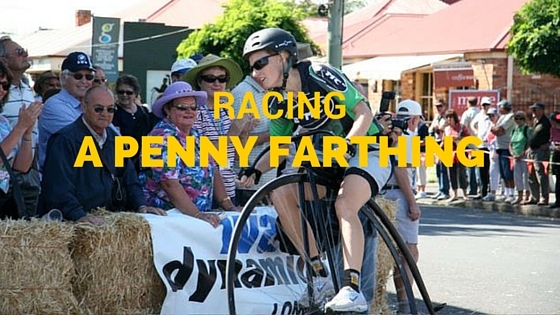 Next up was the Penny biathlon – Run 1 lap, ride 2 laps, run 1 lap. I lined up with about 15 Men for the race. 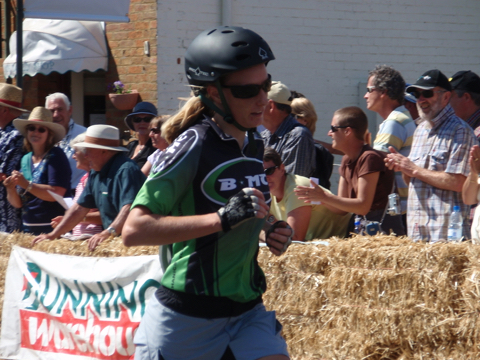 I was the only girl… Anyway, I sprinted off as quick as I could (and held first place until part way round the track!) and tried to keep my pace around the first lap. I thought with a bunch of blokes I could maybe crack them with a fast sprint off the line. Ian was my ‘handler’ and held the bike ready for the transition. My legs felt dead as I got on the bike. 2 guys were ahead of me now, and I wasn’t gaining anything on the bike. Then getting off the bike was a challenge. I didn’t want to come in too fast (remember no brakes on the Penny!) or too slow. But I managed a fairly good transition and did a cool pedal dismount. The last lap running, It was so hot, I was struggling to maintain my speed. The crowd was awesome and I had massive cheers as I came through to the finish line. I finished in 3rd place! STOKED. Photo: Me pretty puffed during the run…. Next up was the sprint a “Straight line dash of 200 meters”. Tony was up next and was up against Ryan Sullivan (who ended up coming 2nd in the National Champs Race). Tony went flat out and came through in 2nd Place! But the problem was he let his feet come off the pedals after the finish line and couldn’t stop. With the barrier coming up quickly he bailed off the back of the bike and crashed to his knees and onto the bike. Taco-ing the front wheel!!. 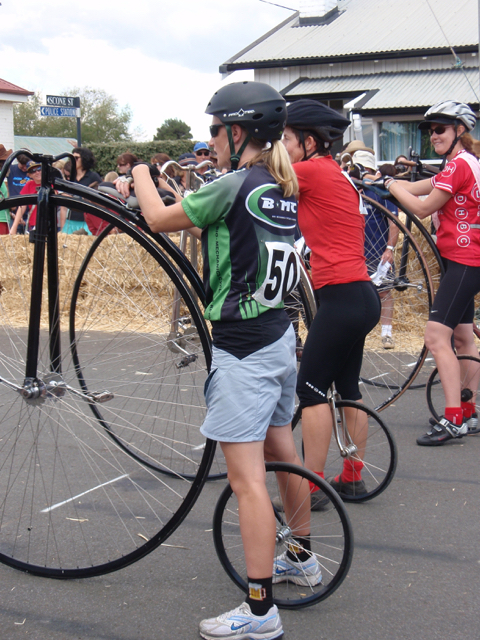 So now we had no bike, and the next race was the Ladies National Penny Farthing Championship Race. So I kinda had no bike to ride. Ian offered his bike, however, this one was much larger than the one I had practiced on. I had a quick ride up and down the road and this bike was BIG!! But it was great that Ian was happy for me to ride it. 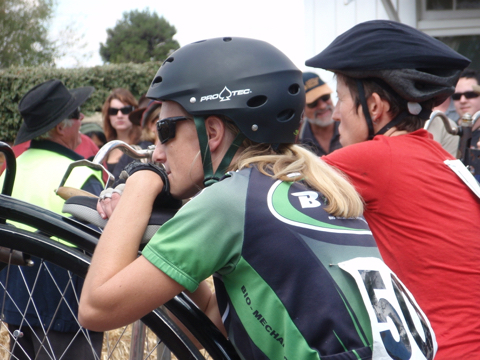 The Ladies race had 8 racers and the reigning National champion present (Bell Chamberlain). 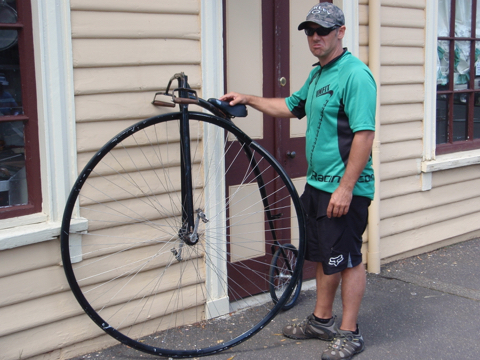 I had a slow start as the bike was heavy and huge. But got going as fast as I could. I was in 3rd place and I pushed as hard as I could on the straights but was a bit tentative on the corners. I could see the 2 girls in front (maybe 20 metres) but couldn’t gain anything on them. Bell was first and Sally in second. I came through in 3rd Place and very happy to get a medal at my first Penny Nationals. Joanna came in first place in the Junior race and Ian in 3rd in the last race of the day. So a nice loot of bling to take home. Photo: Me and my medal. Whoohoo.